I’ve got some bad news: Those nice headphones and great speakers that you spent so much money on? They probably don’t sound as good as they could. You spent the time searching for the best audio gear for your computer, and no one wants to get less than what they paid for. Not sure what I mean? Let me explain. Sound that you play on your computer starts out as a digitally-encoded stream. The built-in digital-to-analog converter (DAC) in your computer converts those bits of data into an electrical signal that is, in turn, fed to the amplifier that makes the drivers in your headphones or speakers move and produce sound. That built-in headphone jack isn’t doing your audio gear any favors. But by its nature, this digital-to-analog-conversion process isn’t exact, so some DACs produce a higher-quality facsimile of the original recorded signal than others. The DAC built into your computer was likely chosen to fit space, power, and cost constraints, rather than for optimal audio performance. And your computer’s built-in headphone amplifier, which is part of the headphone jack’s circuitry and provides the juice that drives your headphones, was picked for similar reasons—and has similar drawbacks. Plus, these components are all sensitive to the sorts of electronic noise that pervade the inside of a modern computer. If you’ve invested in quality headphones or upgraded your speakers, you can use an external DAC to help those components reach their full potential; many external DACs also include significantly better headphone amplification—you use the DAC’s own headphone jack instead of the one on your computer. These upgraded headphone jacks give you tighter and stronger bass, increased clarity and detail, better separation of instruments and notes, and other subtle improvements that add up to an increased sense of pace and musical drama. Taken together, these changes bring you closer to your music. Though many vendors offer large, AC-powered, audiophile-grade desktop DACs and headphone amplifiers, the best values for computer-focused DACs can be found in compact packages—the size of a deck of cards or smaller—that receive audio and power from your computer’s USB port. 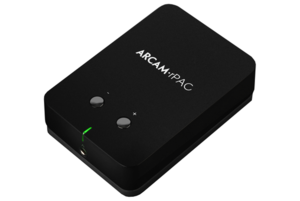 I previously reviewed Arcam’s $249 rPAC (4.5 of 5 rating), which impressed me with its build and sound quality. However, a number of similarly sized and priced models compete with the rPAC, meeting or beating its price, size, features, and/or sound quality. I gathered six such products, ranging in price from $149 to $300. (My guideline: Don’t spend more on a DAC than you did on the partnering headphones or speakers.) Each is small, uses USB for power and digital-audio input, includes a headphone output with analog volume adjustment (controlled via hardware or software), and supports high-resolution audio files up to a 96 kHz sample rate and 24-bit depth (some support 192 kHz/24-bit). Most are based around asynchronous USB technology, in which the DAC controls the rate of data transmission from the computer in order to reduce timing errors (called “jitter”) that can cause audible and measurable reductions in sound quality. All the models I tested are essentially plug-and-play: You simply connect the DAC to a USB port and your computer automatically detects the component and routes audio through it. (If your computer doesn’t automatically switch audio output to the connected DAC, you can perform the task manually in your OS’s audio settings.) If you’ve got a Mac and you’re going to be playing high-resolution audio, you’ll also want to configure your Mac for high-resolution playback (though whether high-resolution offers audible improvements is a controversial matter). 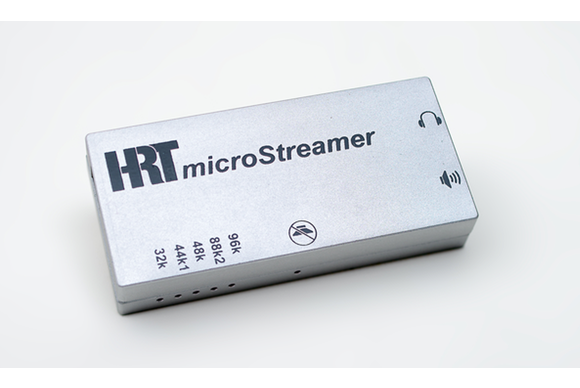 The HRT MicroStreamer and Meridian Explorer offer 3.5mm fixed-level line output (for use with speakers or stereos with their own volume control) in addition to the volume-controlled headphone output. You’ll want to be sure to not plug your headphones into the line-out port, as the higher output level could damage your headphones, or, worse, your ears. It’s easy to do this accidentally, so plastic headphone port caps are a good way to protect your equipment and hearing. Over the course of my testing, I used each model both during my regular listening sessions, and while auditioning headphones for other reviews. For direct comparisons, I used my full-size home stereo and my two reference headphones: the full-size, open AKG K701 (currently available as the $349 Q701), which is particularly picky about amplification, and the $1099 JH Audio JH13 Pro FreqPhase custom in-ear-canal headphones, which can be difficult to drive due to low impedance. I also compared the DACs to the full-size DAC I use in my home stereo, Cambridge Audio’s original DacMagic (discontinued, but $429 when last available; 4.5 of 5 rating). 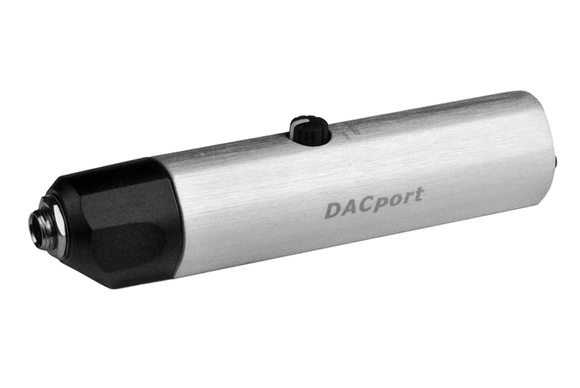 The DACport’s technical capabilities and sound quality were as notable as its form factor back in 2009, kicking off the current generation of highly portable, high-quality, high-resolution USB models. One of the DACport’s features is still unmatched by its newer competitors: Its headphone amplifier is based around a Class A design, which proponents argue produces better audio quality than Class B and D designs. This approach also means that the DACport is less energy-efficient, as power not used to drive headphones is converted to heat—the DACport gets warmer than the other units here, though never outright hot. However, while other models in this roundup use asynchronous data transfer, the DACport uses adaptive transfer—in which the computer controls data transfer, potentially increasing jitter—but in combination with the company’s proprietary jitter-reduction technology. Following the DACport by a few years, AudioQuest’s $149 DragonFly takes the DACport’s basic topography—USB input on one end, and a 3.5mm headphone jack on the other—and further shrinks and simplifies it. A standard USB plug is integrated into the unit, allowing the DragonFly to plug directly into a computer like a thumb drive. (Indeed, the device looks essentially like a thumb drive.) The DragonFly also eschews a physical volume control, relying instead on the host computer’s software volume setting. A recent hardware revision, to version 1.2, included some improvements to the device’s audio circuitry. The DragonFly, designed in cooperation with DAC expert Gordon Rankin of Wavelength Audio, is charmingly small, well-built, and offers impressive performance. Despite its small size, the unit feels substantial, and it has a pleasant-to-touch rubbery exterior. The DragonFly logo on the outside lights up to indicate (by the color of the light) the current sample rate (up to 96 kHz/24-bit). AudioQuest includes a leather carrying pouch and a cap for the USB connector. 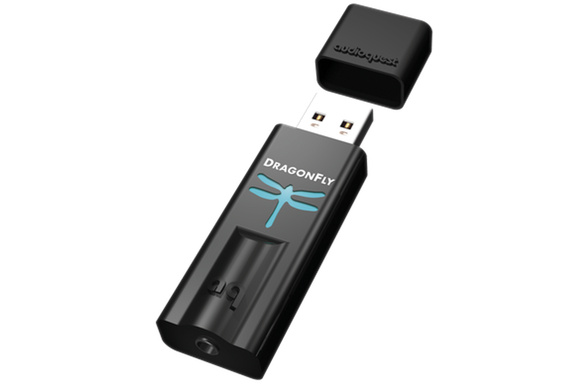 Due to its thumb-drive-like design, heavier headphone or interconnect cables can cause the DragonFly to strain your computer’s USB port, so the company also sells the $17 DragonTail: a short USB extension, based on the company’s Carbon line of high-end USB cables, that also prevents the DragonFly from blocking tightly-spaced ports on your computer. The DragonFly’s small size and all-in-one design make it a particularly good match for use with a laptop on the go. Thanks to this convenience, I frequently grabbed the DragonFly for portable listening. 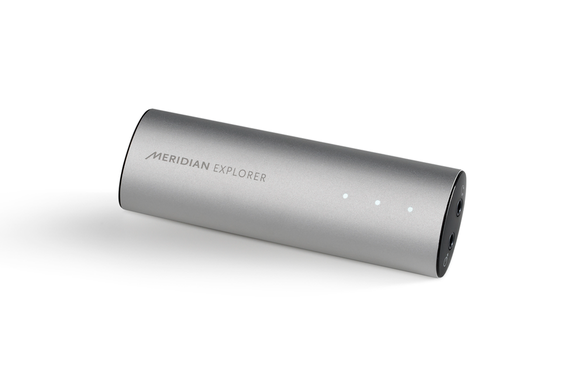 Meridian is a big name in the world of digital audio, and in 2013, the company jumped into the portable DAC/amp market with the $299 Explorer. The Explorer is an ovular, aluminum tube, closer in size to the DACport than the DragonFly, but much lighter; a flat, rubberized underside helps the device stay in place. Like the DACport, one end of the Explorer features a Mini-USB input, while the other hosts a software-volume-controlled, 3.5mm headphone jack. The output end also features an auto-switching 3.5mm analog/digital output, much like the one on most of Apple’s recent computers. You can use the analog output to connect to a full-size stereo or powered speaker system; the optical output lets you use the Explorer as a high-quality USB-to-optical converter, so you can connect your computer to a higher-end DAC that lacks USB input. Along the top of the Explorer are three white LEDs that indicate whether the sample rate is 44.1/48, 88.2/96, or 176.4/192 kHz—the Explorer is one of two models I tested that support this last rate. Meridian includes a short USB cable and a carrying pouch. High Resolution Technologies (HRT) made a splash in the hi-fi DAC market a few years back with inexpensive designs that nevertheless offered high-quality USB-audio inputs at a time when many DACs included this feature only as a toss-in afterthought or an expensive add-on. The company’s latest model, the $190 MicroStreamer, is its most portable. 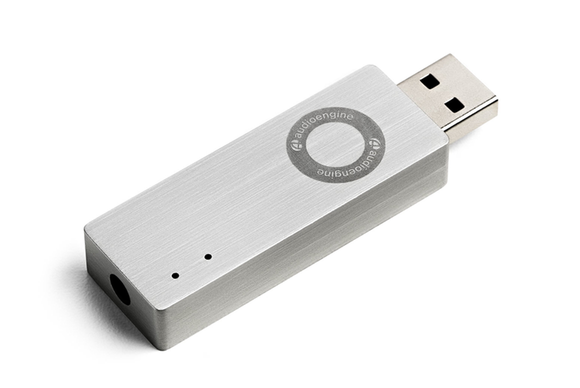 The MicroStreamer is a plain, but well-made aluminum box, slightly larger than the DragonFly, with a Mini-USB input on one end and two 3.5mm audio outputs on the other end. As with the Explorer, one of these is a line-level output for connecting to an audio system, while the other’s level is software controlled for use with headphones. Along the side are a series of LEDs to indicate the incoming sample rate (44.1, 48, 88.2, or 96 kHz), and whether or not the unit is muted (via software). HRT includes a USB cable and carrying pouch. The MicroStreamer’s firmware can be updated over a USB connection to a Windows PC; a recent update brought a cool new feature: the capability to use the MicroStreamer with iOS devices. The iPad—and, as of iOS 7, the iPhone and iPod touch—unofficially support USB DACs via Apple’s Camera Connection Kit USB adapter or Lightning to USB Camera Adapter, but only if the device’s power draw is 100 mA or less. The MicroStreamer’s version 1.2 firmware reduces power draw to 98 mA, making it the only bus-powered DAC I’ve found that works with a direct connection to an iOS device (more on iOS compatibility in a bit). This change in power draw also benefits people with Android devices that support USB On The Go. Audioengine has made a name for itself with its excellent powered monitor speakers, which have become popular as alternatives to computer speakers, iPhone/iPod docks, and even small home stereo systems. The company also offers a line of high-quality electronics, including the N22 desktop amplifier and the brand-new, $189 D3 Premium 24-bit DAC headphone amplifier and DAC. The D3 mimics the DragonFly’s thumb-drive form factor. The D3’s attractive, brushed-aluminum case sports two LEDs: One indicates power, and the other indicates a high (88.2 or 96 kHz) sample rate. The D3 comes with a carrying pouch and a 1/4-inch-to–3.5-mm headphone adapter. (The company also makes the older, $169 D1 Premium 24-bit DAC, which is larger but offers an optical-digital input, RCA outputs, a hardware volume knob, and 176.4 and 192 kHz capability).